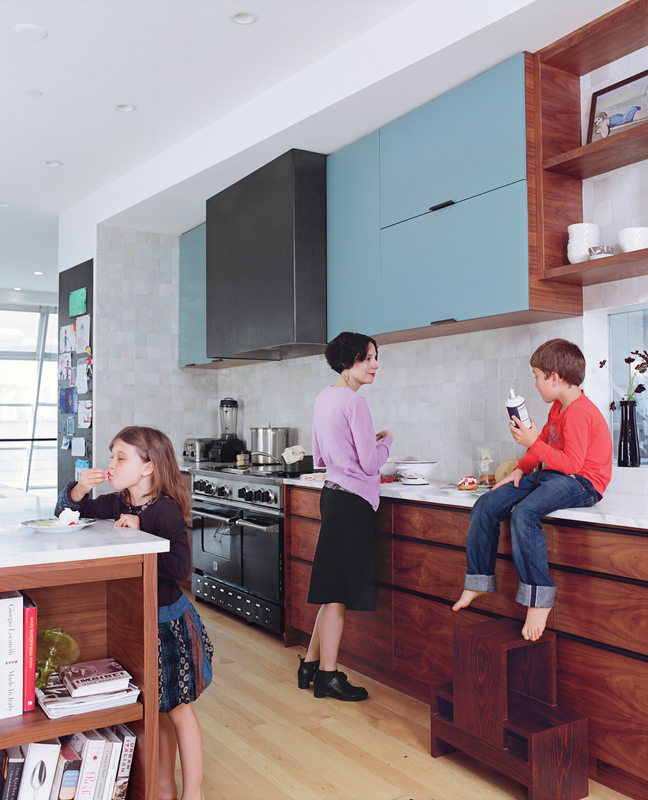 Driven by the death of several appliances, a San Francisco family finds that a spanking new kitchen delivers a good dose of domestic harmony along with the excuse to execute a complete home makeover. The Sub-Zero beverage chiller sits in easy proximity to the lounge area adjacent to the kitchen. Risom lounge chairs were rewoven with cat claw–proof leather strapping after the originals were shredded. 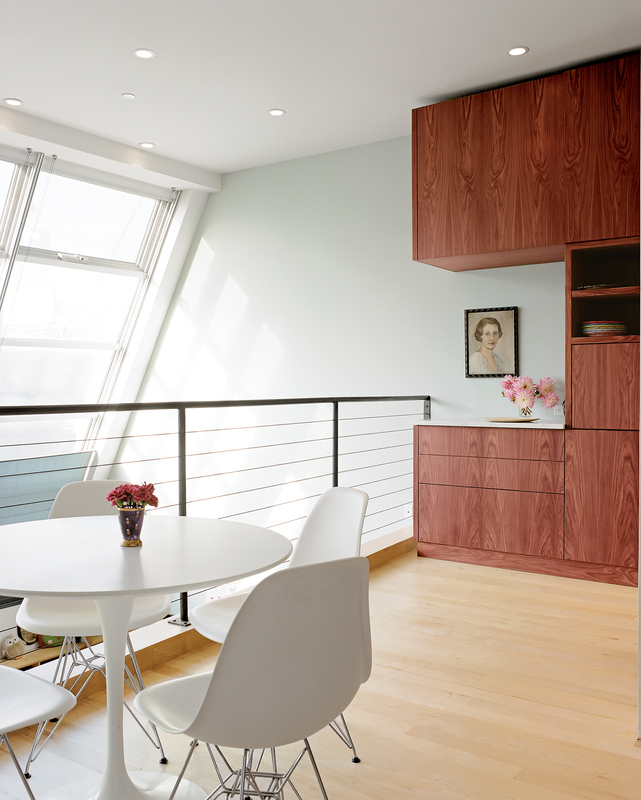 A small cafe style dining area off of the kitchen is drenched in light. Sasha samples berries at the island while Wes, perched on the counter next to Deborah, clutches the whipped cream—similar in color to the backsplash, made of traditional Moroccan tiles and available through Emory & Cie.
Vintage pendants cast a soft glow over the island, which contains a Bosch dishwasher. 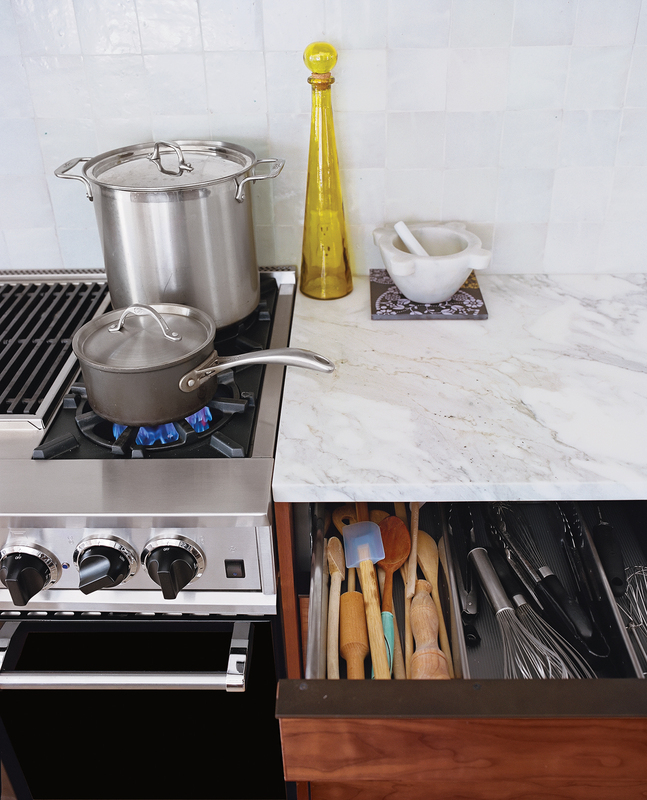 Organization is key: Blum storage systems in the Henrybuilt drawers keep the whisks from ensnaring the spatulas. Michael tends to his capons in a Big Green Egg. Molteni dining chairs are overseen by “someone’s” ancestral portraits. The living room is a mélange of vintage Moroccana, a Philip Agee coffee table, the Eames rocker in which Michael was nursed as a tike, and a window seat whose fabric is Paul Smith Stripes for Maharam. The specter of Jeanne Moreau hovers over the playroom, which flows into Sasha’s room. Flanked by vintage Schiaparelli perfume ads, her Blu Dot Modulicious bed conceals six drawers, obviating the need for a dresser. Wes sits at Michael’s boyhood Herman Miller Swag Leg desk, as Sasha peers down from the stairs connecting their rooms, illuminated by a Flos Glo-Ball lamp. Deborah’s office, which shares a wall with Wes’s new room, is a repository for assorted claptrap. The bedroom flows into the new ipe deck, which houses a poplar table by Mike and Maaike and Drake chairs by One & Co, from Council Design. Bookcases abound in the master bedroom, which has a vintage Moroccan rug from John Derian and a painting by Ward Schumaker. The bench and bedside table are by Philip Agee. After my family and I moved back into our San Francisco home following a renovation exile, I couldn’t bear to do much more than boil water in the virginal kitchen, for I knew I would never see its like again. When the first hot sprays of oil hit the creamy backsplash and Rorschachs of tomato sauce pooled on the counter, I stood clutching dishcloths and keening like a mourner in a Greek tragedy. Our new kitchen was spurred by the simultaneous death of three key appliances: the range, the fridge, and the dishwasher. That the 14-year-old stove—a so-called premium brand that cost the equivalent of a decent motorcycle—was beyond repair seemed improbable, but an electric heating mechanism had expired and the company no longer made the part. As the sagging stainless-steel-topped maple cabinets were not up to endeavors such as sequestering compost—and harbored dinosaurs such as a trash compactor—we embraced change. The primary cook in our household, my husband Michael Lieberman, embarked on a hero’s quest for a new stove, the central hearth of the modern home. “I wanted something simple that cooked really well, without a bunch of gadgets. I could never get the heat on our old cooktop high enough, and I had to jerry-rig crazy systems to get it down to a simmer,” Michael says, explaining what led him to BlueStar—his gas convection oven, grill, and griddle-equipped holy grail. During the demise of the previous range, Michael took to cooking the protein course on the back deck, which connects to the kitchen via a flight of outdoor stairs. Here, amid pots of self-sustaining succulents, sits a Big Green Egg and a bag of hardwood charcoal. Based on an ancient Japanese clay cooker called a kamado, the Egg is wrought from a space-agey ceramic that reaches 1,800 degrees Fahrenheit. Fish, chicken, rabbits, and even entire suckling pigs go into its maw, emerging a while later intensely juicy and utterly delicious. With heat sources in place, I turned for design assistance to Charles de Lisle, who has collaborated with us as first cohabitation, and then children, redefined our needs. The exposed kitchen is the hub of our open-plan house, and I wanted cabinetry crafted along the lines of fine furniture but equipped with the kind of uberfunctionality built into Euro-pean systems. And, since Michael had declared this to be the “remodel to end all remodels,” it had to be easy on the eyes for years to come—“until we die,” he intoned. The primary casework is by Seattle-based Henrybuilt, a company that joins beautifully crafted, customized cabinetry (using woods certified by the Forest Stewardship Council) with refined systems for corralling compost, utensils, pot lids, and the like. 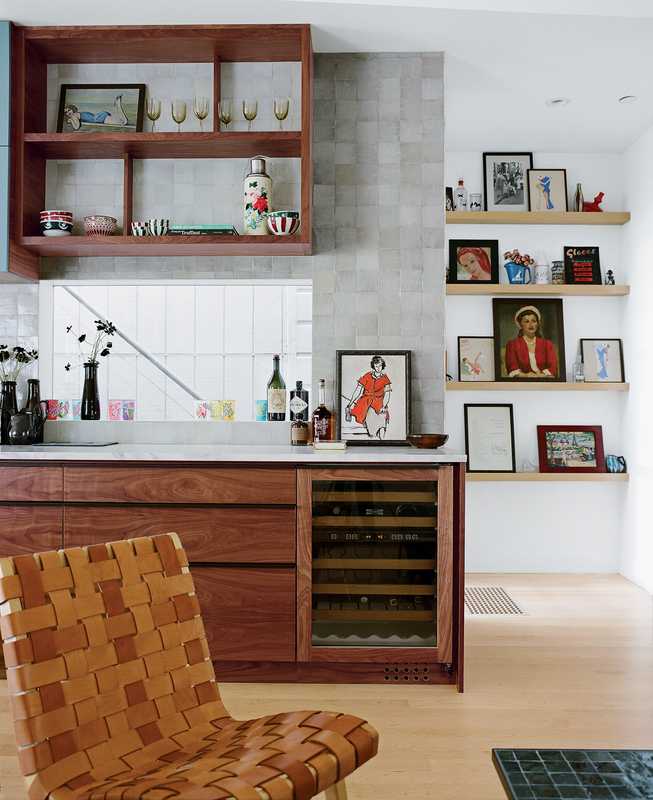 Solid bookmarked walnut panels contain the armada of appliances that once lined the counter, and soft-closing drawers inspire a kind of ecstasy. I spotted the Moroccan backsplash tile in the World of Interiors and was drawn to its irregularity and soft sparkle (the installer, somewhat perturbed, cautioned, “You know, it’s not all going to lie flat”). Artifacts such as the Shaws Original handmade fireclay sink, large enough to bathe a farm animal or stash a party’s worth of unwashed dishes, are far too heavy to ever move again. And despite my trepidation, Michael and I wanted an old-school counter material, one that would reflect years of gatherings rather than remaining resolutely pristine. The warm brown veining in the Calcutta marble is more compatible with the wood than cooler Carrara, and freckles of mineral deposits set the stage for the mottling to come. Now covered in ipe, the deck overlooks South Park, an oval greensward south of Market Street a few blocks from Jack London’s birthplace. Designed during the gold rush to resemble a classic London terrace, some of the gracious villas were reborn as rooming houses after the economic bust of the 1850s. By the 1980s, cab drivers refused to come here; by the ’90s it was ground zero for the dot-com boom and bust. Today, the area is an urban mosaic of fancy new infill construction, older residences, architecture offices, businesses such as Twitter, cafes, and single-resident-occupancy hotels. Our house was one such hotel, converted by Michael from a 27-room, burned-out Victorian rooming house into a single-family, two-bedroom home. Back then, a youngish buck with a yen for open space, he clearly had no conception that our seven-year-old twins, Wes and Sasha, would one day be clamoring for their own rooms. Loudly. Since the only way to gain a room was to carve it out of an existing space, we claimed the back of my ground-floor office for Wes’s bedroom (adieu, Pilates machine). But we wanted him to feel connected to the interior of the house. So our friends at Surfacedesign, Inc., Roderick Wyllie and James Lord, devised a way to cut through the wall, joining his room with Sasha’s via seven stairs and a Lilliputian doorway leading into their former closet. Shelf- and cubby-endowed maple panels define his room and a small adjacent library. And pieces like the George Nelson–designed Swag Leg desk of Michael’s boyhood have passed to the next generation. and colors, softening the architecture without getting stuck in a Peter Max acid trip. Now that the whining of handsaws and pounding of hammers is a ghostly memory, I’ve softened on trying to stem the inevitable destruction. The refinished floors bear traces of colored markers. A clutter of toys moves around the new kitchen island like tumbleweeds. The “no shoes” policy lasted less than a day. And I feel inspired to toss a glass of Barolo onto the honed marble counters, just to keep things moving in their inexorable direction.